WToday we drove to Freissinières Valley, with intention to climb one of the shorter and quite popular route in the area: Happy Together or Ice Pocalypse (both around WI4, 100m), but changed our mind after 2 pitches of Happy Together and took the right varian that brought us up to up on 550m WI5 epic: Au-delà des ombres (eng:” Beyond the shadows”). 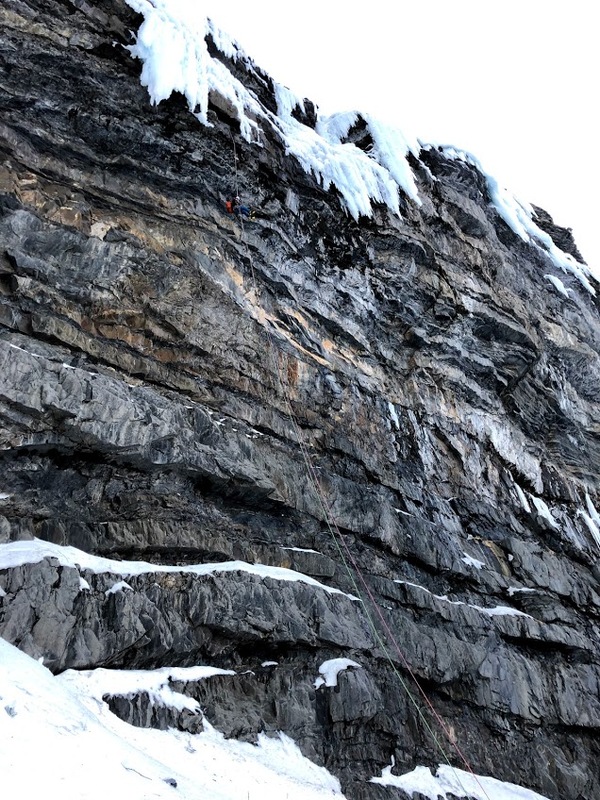 We did 85% of the route (skipping last 3 pitches, do to late hour) – had to retreat around 3pm to make it to the ground before dark – it’s not easy to navigate 480m of abseils in unknown terrain in the dark. 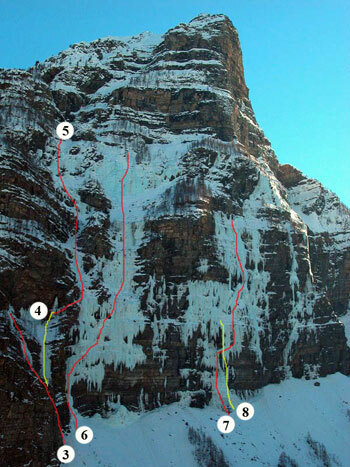 According to the guidebook, the route climbs in 12 pitches, but as it is with ice climbing, these things are never set. I’ll do detailed (pitch by pitch) write up tomorrow, as it’s pretty late now, and we are very tired right now. 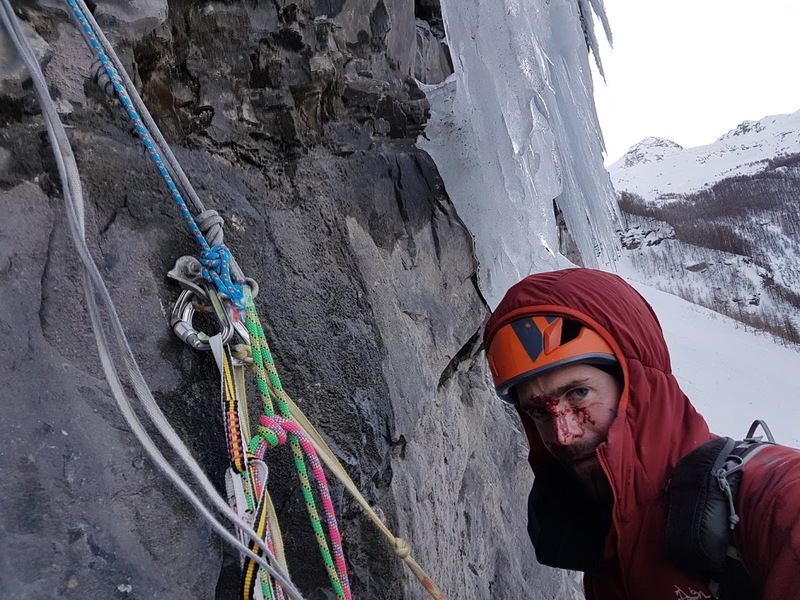 Either way the whole thing turned into somewhat epic, with a lot of simul-climbing, near lead fall on 90deg steep terrain, bloody face after meeting with falling ice, series of dodgy abseils on dubious V-Threads, stuck rope on rock roof… to name just few. Luckily we got both safely to the ground just before it got dark. Me on the last of series of free hanging abseils. As I said yesterday here’s how the route went. Pitch by pitch. 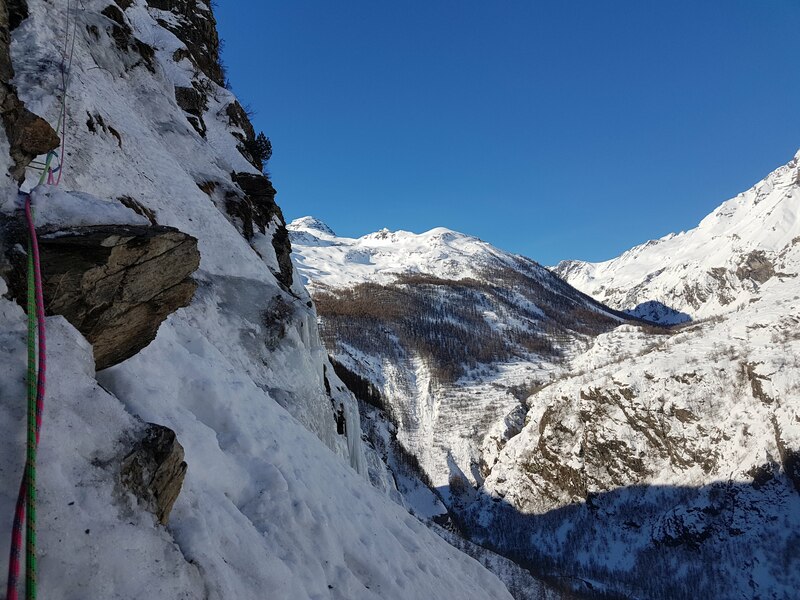 We showed up at the bottom of the route at around 9am (it’s 30 min walk from the car park, mind the steep walk in right up the avalanche path) with intention to climb Ice Pocalypse (WI4, nr 4 on the map above or Happy Together (WI4, nr3). Me near the end of P1. and Peter did the 2nd one via it’s steepest line (WI3+/4), we decided to take the right turn (Happy Together), and perhaps see what was beyond. I did that 3rd pitch (WI3+/4 55m, easy with 10-15m at 85 °). 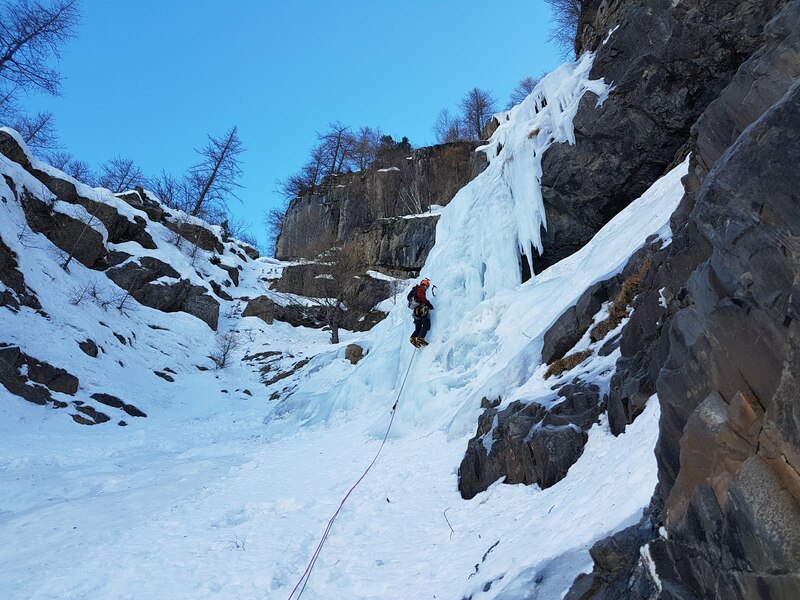 But since we only had 50m ropes I essentially run it till end of the rope and belayed from 2 poor screws and an ice axe. This marked the end of Happy Together route. To our surprise there was no one here ( except from 2 French guys who passed us on P1, everyone must have gone the other route, to the left) and it seems like an adventure in the making. 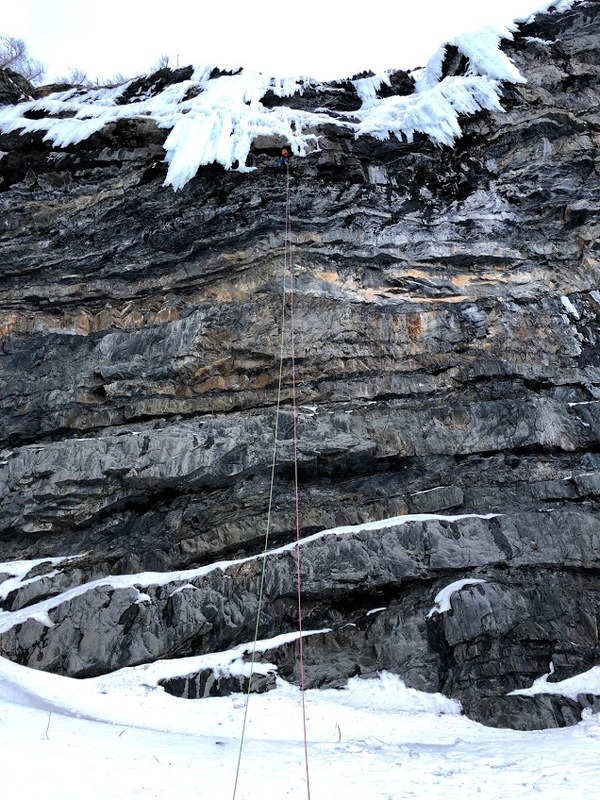 For P4 we agreed that Peter will climb the remaining 10m of the pitch, see what’s beyond and if it’s easy enough we’ll simul-climb for as long as possible. 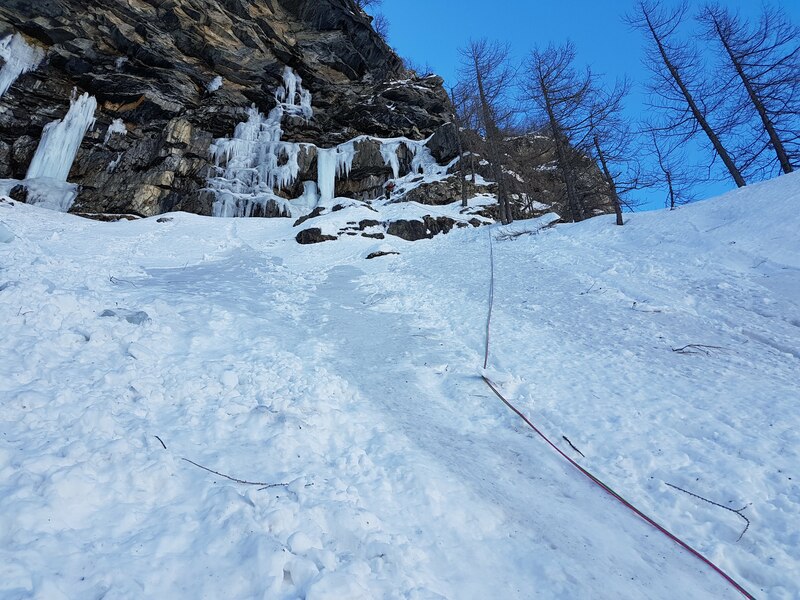 It turned out to be probably 2.5 rope lengths (so over 100m) of easy enough terrain (some small ice steps and a lot of snow slopes, where Peter was only able to put 2 pieces of protection. End of what we’d call P4. 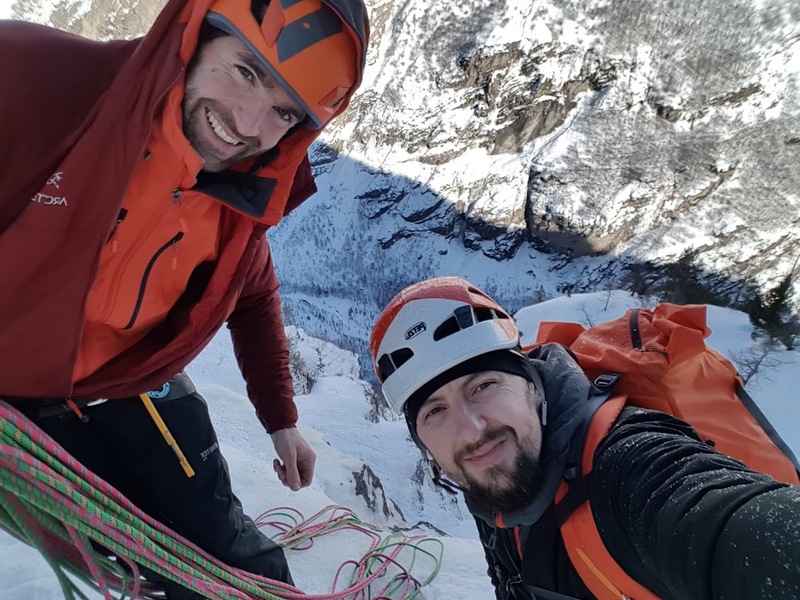 For non climbing readers: simul climbing, or moving together, is a technique where both climbers climb at the same time, with the full rope length in between them. 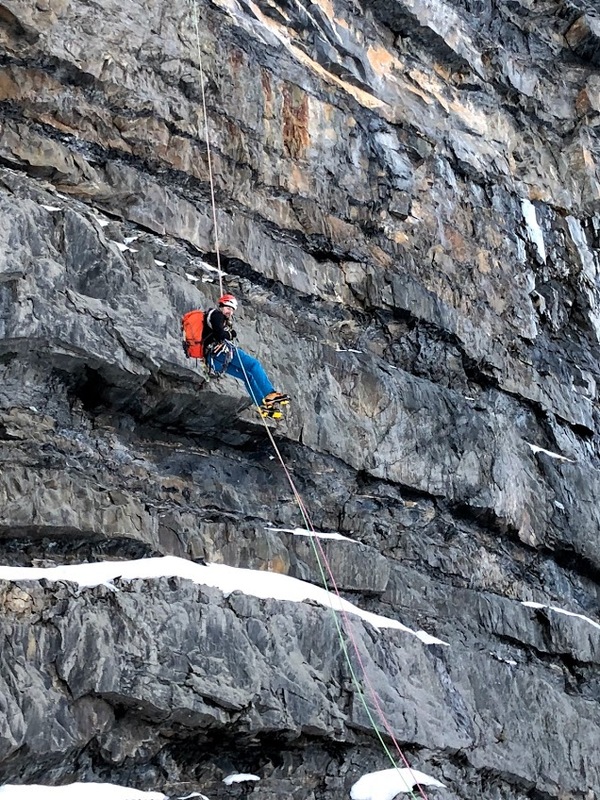 No one is belaying and the protection is ensured by whatever the leader will put (sparsely), but generally falling of is rather not recommended. 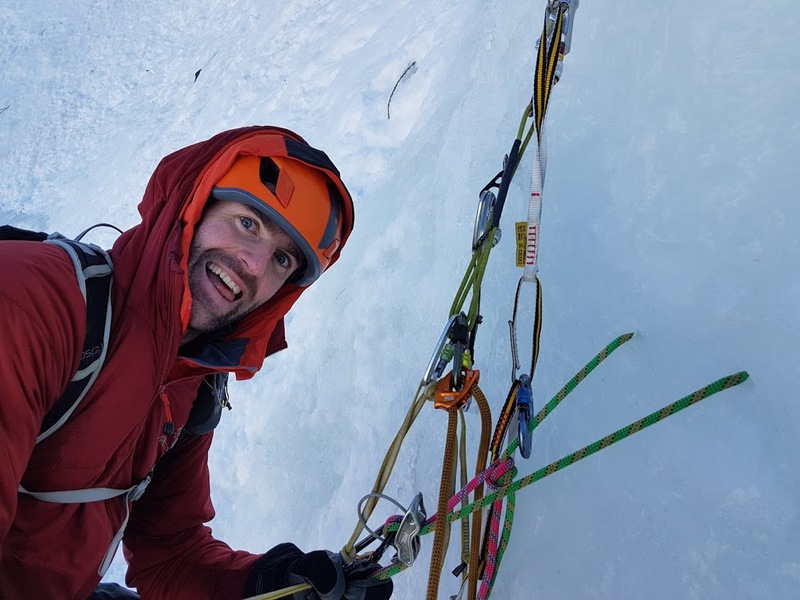 When I got the tree which marked the last protection we had (seen on above picture on the right) and belayed Peter from there (since he was already at the base of the start of the next bit of steep ice. (there was an option to climb the pillar (seen in the middle of the photo above), but we opted to just take the bit of ice on the right (since we still had loads of terrain to cover [we werent sure how much exactly, it later turns out to be 300 more meters] to go and were time cautious. 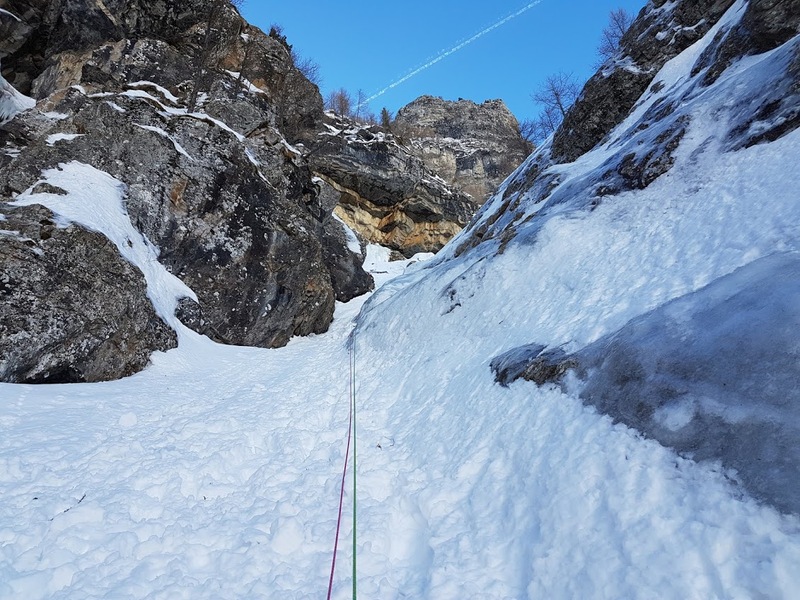 Peter quickly disappeared around the corner and I could only be giving rope… 50 meters went and I could just start climbing once there was no more rope to give out. Communications wasn’t possible, as he obviously was traversing out of sight and reach of sound. We have procedures for situations like that, so it was all standard for us at this point. 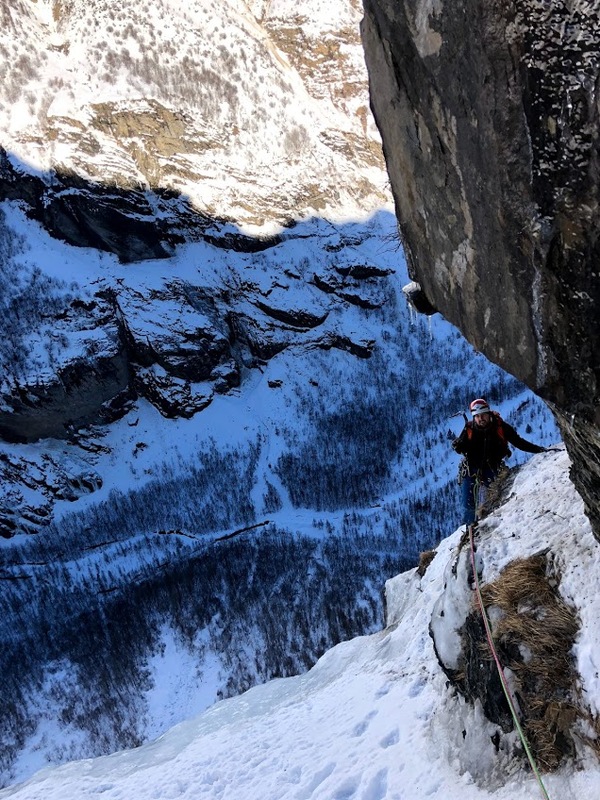 The scary, exposed, snowy traverse. The rope stayed tight as I was moving, so I knew Pete found a belay and we were going to be ok (aka won’t die). My poor soul happy to see Peter waiting with the camera at the end of the traverse. We quickly did a swap of gear and I set of for another rope length of easy enough terrain (WI3 or so). Peter’s belay, we swapped here and I moved for as much rope I had. I brought Peter up, we swapped over again and agreed to move together once the rope gets tight, should the terrain be easy enough again. He only got some 10m of ice and disappeared again. Rope was going fast, meaning he was probably going on a snow slope. 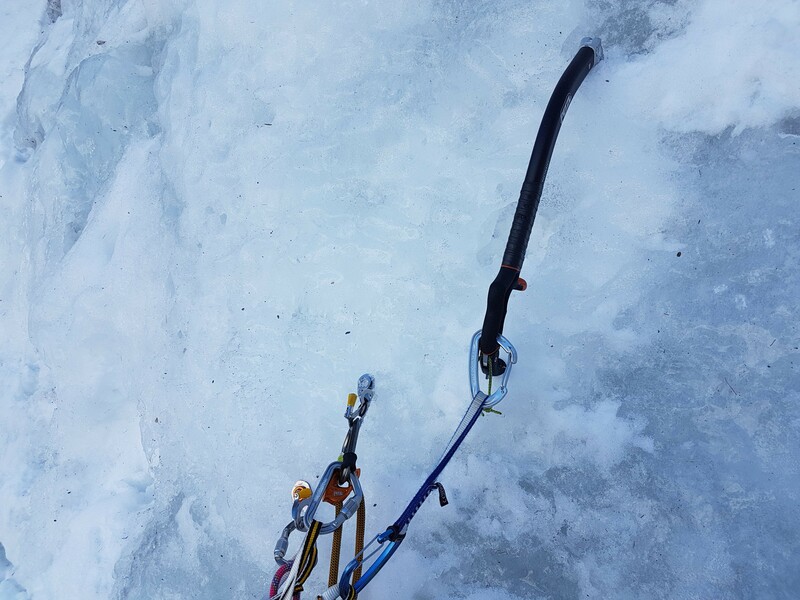 Once I had 10 or so meters of it left I started disassembling the ice anchors and moved on once the rope got tight. Indeed snow slope it was. 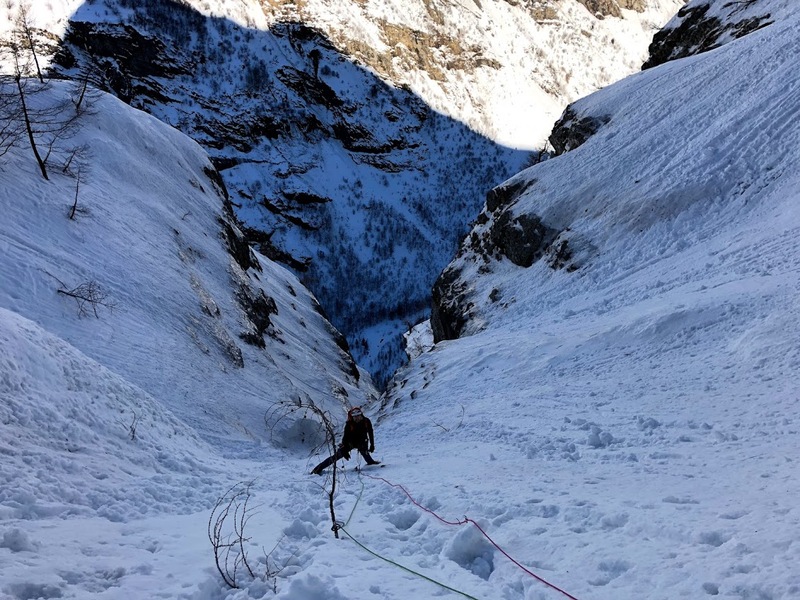 And not a regular one – it was a massive funnel that went for some 150m and was the escape route for all the avalanche snow coming down. Luckily we knew the avalanche danger wasn’t high and it was safe enough to move that terrain. Looking up the small funnel passage. This is not the place to be if there is a lot of snow above. The snow was deep and there wasn’t many foot steps. We were obviously in adventure zone not generally visited by regular weekend warriors. The other side of the funnel. The pictures don’t reflect the seriousness of the surroundings. What was in front of us though was the ‘money pitch’. 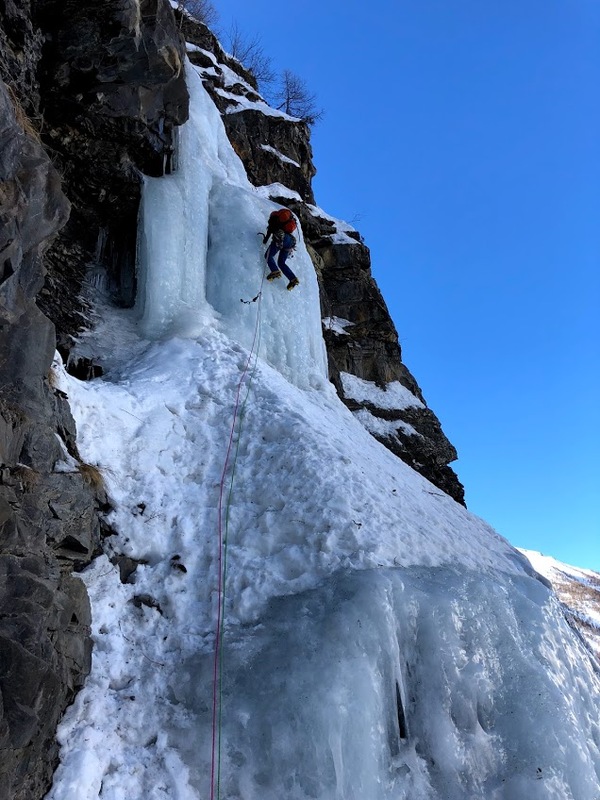 A massive curtain of super steep ice and since technically it was Peter’s lead (the snow slope wasn’t really a pitch) it made me happy inside as I wasn’t really looking forward to lead WI5. Peter on the WI5 pitch. The hardest he ever lead. He moved confidently and I knew that he will make it. When he was around half way up, the two French guys whom we met at the beginning of the route started their abseil. 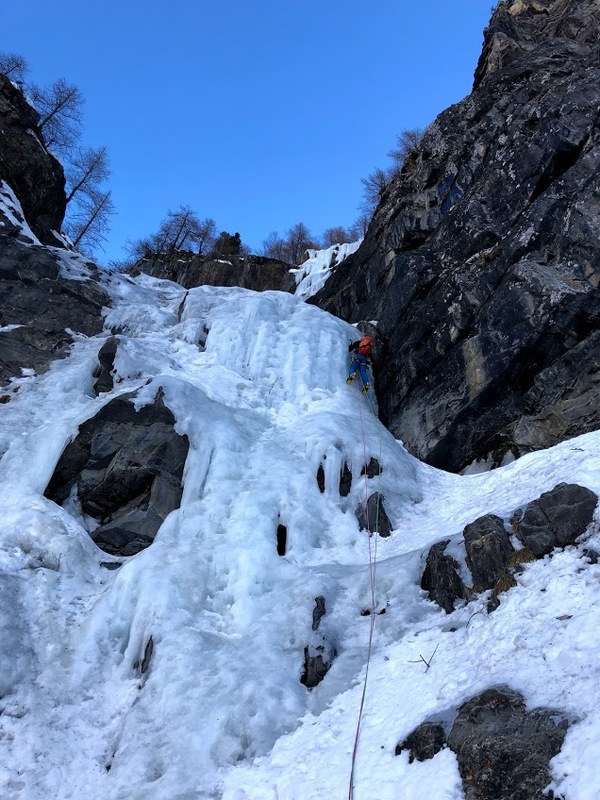 We asked them about the route and were told there’d be another 3 pitches of moderate ice (for around 80m, which matched the books route description), and a long, tedious abseil to the ground, mostly by time consuming V-Threads. Now Peter was out of sight for me and to best of my knowledge he was just plowing on. It did take a while, but that’s expected. Eventually he shouted “safe” and It was my go. 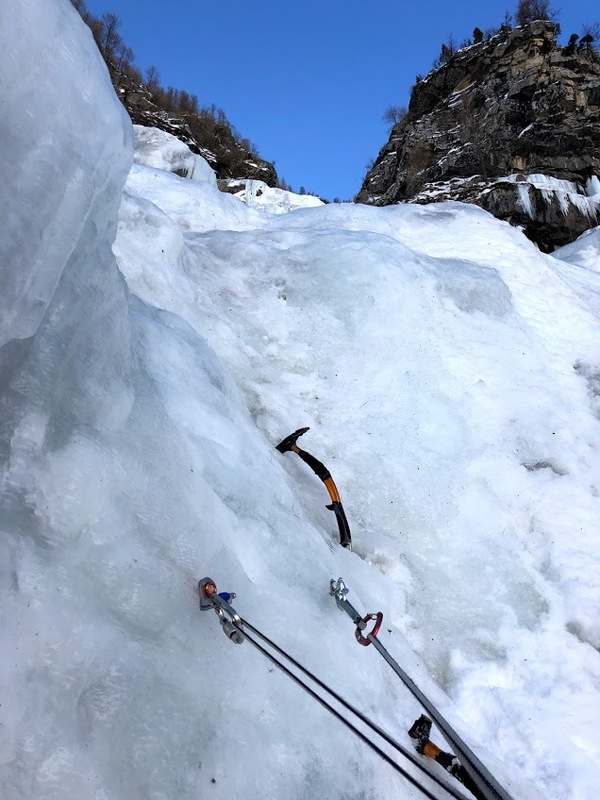 The route went straight up on near vertical Ice for some 20 meters and then traversed right on a really dodgy snowice and up for another 10 meters on less steep ice. After I joined Pete at the belay we decided to start our descent as it was already 3pm and it would take at least 2 hours to get down. Victory photo at ‘our’ top. Something felt off though as Peter seemed a bit shaken up. He told me straight away, without me even having to ask that he nearly lost it on that pitch. He told me how he lost his footing and essentially was hanging by 1 axe scrambling not to fall. Luckily he recovered himself and was able to finish the pitch. Anyway, the abseiling adventure begun. First thing off, no bolts, so I had to construct first of the series of V-Threads. This time I decided to go 0-thread – and it worked like a charm. Peter impressed with my V-threading job. I backed it up for him with a screw and off he went. Next two abseils were off trees, which was handy as it saved a lot of time. They were also spaced so our 50m ropes were enough. 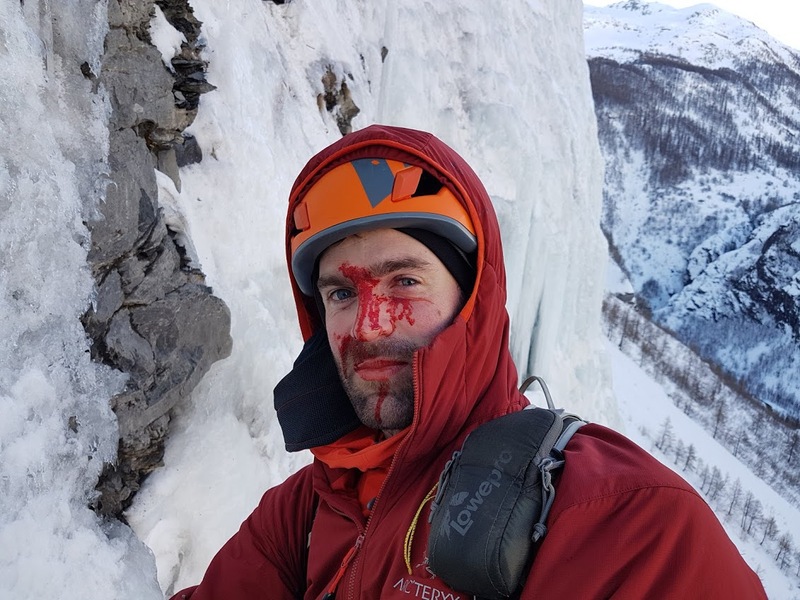 Unfortunately during one of the abseils Peter got hit and banged up by falling ice. Few open wounds on his face made him look like he met pissed of Mike Tyson. We obviously both carry first aid kits, but there was no need for any serious doctoring so we decided to just keep going (as there was still few abseils to go). Another 3 rope lengths were on V-Threads again. We were able to reuse (and backup) some of them which sped up the process significantly. Drilling a V-thread is always time consuming. The last 100 meters was the most nerve wrecking though. First Peter overshot abseil point, so he had to make himself safe, I got down and pulled him in. Then we abseiled of a roof into free-hanging situation with into naked wall, with nothing to abseil off! Luckily for us again there were a pair of ‘hidden’ bolts directly under the roof! 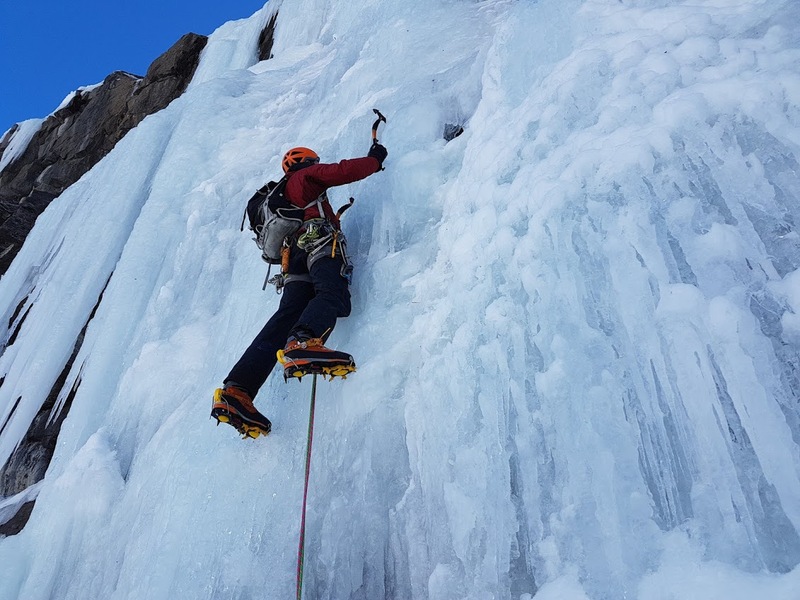 Peter was able to use his ice axe and pull himself to it. We were nearly done. Quickly now, let’s just pull the ropes and hope they won’t get stuck – we are only 40meters to the ground, and in a point of no return – there was no way to climb the ropes back as we were under a massive roof. And of course the ropes DID get stuck… the knot seem to lodge itself at the mouth of the roof… We were cooked… Almost. 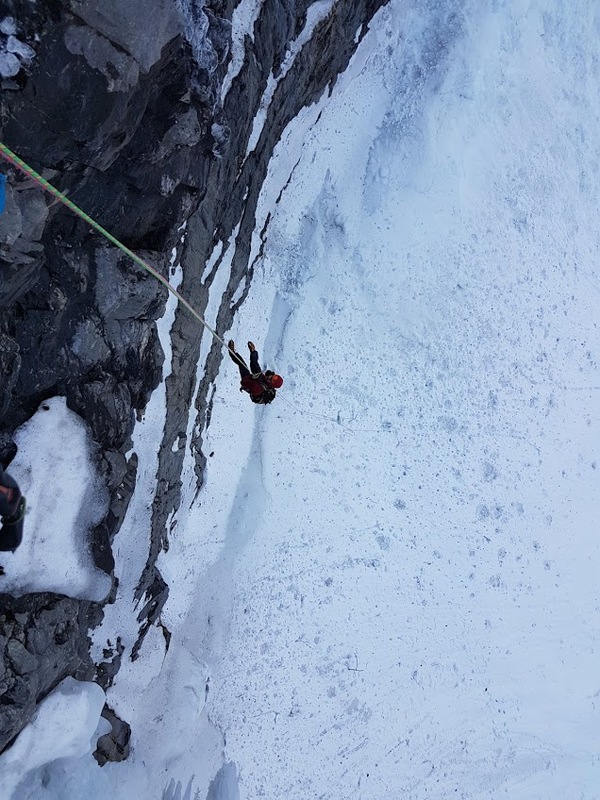 One end of the rope was already touching the ground – worst case scenario we tie it off, and abseil of it, leaving both of them behind. – We looked at each other and almost at the same time said – one more tug. It worked. The knot connecting the two 50 meter ropes dislodged itself in whatever groove it was stuck in and we were ready to rig for final abseil. Peter on the final abseil. Free hanging ones are always fun! Me under the roof getting ready to get down. Few more meters and we are safe! Kind of. 25 minutes later we were back in the car, happy as always after big adventure. After all we got exactly what we wanted. Yet another set of unforgettable memories! In the mean time Sarah and Ronan did a route on the other side of the Valley, so we didn’t see them all day. They also had mini epic, but that’s a story for another post. A guest write-up perhaps guys? Today (Day5) we actually got back to the same area, and did other routes. I’ll do a write up tomorrow (too much going on right now).